When much of what is now Highland County was still wilderness, Thomas McCoy, along with his wife and child, arrived in the Belfast area from Bourbon County, Ky. and fashioned a cabin a little northwest of where the village was later established. By 1804 other families had arrived in the area, and in 1804 Job Haigh hosted the first worship service in his home. That first service was led by a Baptist minister, but by 1815 a Methodist minister by the name of the Rev. James Quinn arrived in the area and hosted a service in the home of Samuel Clark near where the Haigh Cemetery stands today. The Belfast United Methodist Church traces its history to that meeting and this weekend it will host a 200th anniversary celebration in the same building it’s been meeting in since 1893. The celebration will begin Saturday about 10 a.m. There will be lunch at noon, a dinner from 4-6 p.m., a concert featuring the Hardy Boys at 7:30 p.m., plus a quilt raffle and other activities at the building located at 1862 SR 73. “It will kind of be an old-fashioned days get together with lots of good food to eat and an art display of the history of the church,” said Dorothy Countryman, the anniversary events chairman. The celebration will continue Sunday with worship at 10 a.m., featuring visiting pastors and special music, and a potluck lunch at noon. The public is invited both days. Today, about 30 people regularly meet at the church each Sunday morning for services that have been held at the same location for more than 122 years, Countryman said. When the first Methodist classes were held in the Belfast area in the early 1800s, lay persons throughout Ohio gathered in small groups to worship according to the teachings of John Wesley. When a pastor was available to meet with them, they celebrated the two sacraments, baptism and communion, in addition to worship. The members of the Belfast Methodist Church rotated the meetings among their homes. Clark and his wife, Mr. and Mrs. Spencer Wilson, and Mariah Haigh were early members and hosts of the group. Since records do not mention specific pastors again until 1840, and the Ohio United Methodist Archives do not list any pastors for Highland County in this period, it is assumed that the congregation was kept alive by the lay members of the community in the interval between visiting circuit riders. Shortly after Belfast was platted in 1834, James and Elvira Redkey sold one acre located on the west side of Furnace Road, or present-day SR 73 about two miles north of Belfast, to Jacob Shup, John Haigh, Daniel Milburn, Jacob Hall, James Kennedy, Henry Waldron and James Redkey, trustees of the Belfast Episcopal Meeting House. The property is currently known as the Hastings Cemetery, but has also been known as the Mt. Pleasant Cemetery and the Wisecup Cemetery. In 1841, using 50-foot logs, the members built a church in Belfast. The quarter-acre lot was transferred to the congregation for $25 by Lancelot and Ann Brown. The log church was used until 1893 when a new building was completed. The logs and lumber from the old church were sold to Aaron Brown and he used them for a barn on his farm on North Union Road. In 1850, the congregation became part of the Sinking Spring Circuit, where it remained until 1879. During that time, 31 different pastors served. When the Belfast Circuit was formed in 1880, a new group of pastors visited the congregation, usually for a single year each. Most notable among them was Charles Harley or Hartley, who served from 1889 through 1893. During his tenure a camp meeting was held in a grove near the village and over 1,000 persons attended. In 1913, the Ladies of the Belfast Church organized as the Ladies Aid Society. Dues were 10 cents. The ladies hosted an Easter Sunday Supper at the Odd Fellows Hall on March 22 that year. The menu was pressed chicken, egg salad, pickles, bread, pie and coffee. In 1923, carpet was purchased for what was then called the Belfast Methodist Episcopal Church. The church became the home church of the Belfast Methodist Charge in 1954. At that time the pastor was the Rev. Kenneth Nason. Officers elected were John Haigh, chair; Ed Jones, vice president; and Gerald Newman, secretary. In 1958, the Rev. Roy Locher became the minister and a new parsonage was constructed on land east of the church. The parcel was donated to the church by Mr. and Mrs. Roy Carroll. 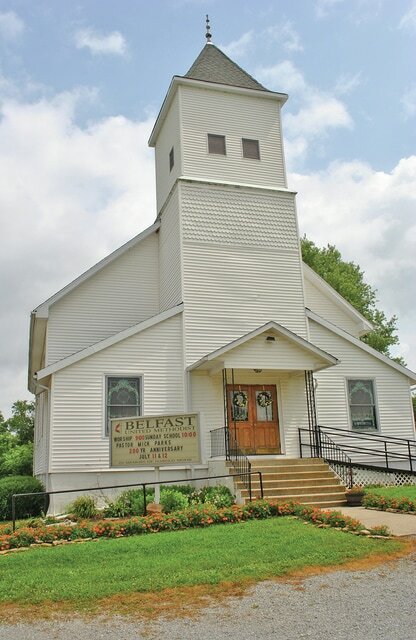 In 1963, the church was raised from its foundation and a full basement with a kitchen, space for fellowship gatherings, and a Sunday school room were added. New chairs and tables were purchased and the interior of the church was redecorated. In 1964, the church members began making ice cream, using freezers from the Sardinia Presbyterian Church. The original socials became popular ice cream suppers about 1968. In 1979, the ladies began hosting a church outing during the month of August. In 1985, they developed a soup kitchen and clothing cupboard to help people during the rough economic times. By the early 1990s, they were serving fewer than 10 people on a regular basis and closed the project. In 2011, it was determined that the bell tower had deteriorated significantly and would need to be closed. Throughout 2012, the stained glass windows were restored and the sanctuary was completely redecorated. In 2014, after 44 years, the church held its last July 4 weekend ice cream supper. However, the church continues to participate in a number of ministries. Every fall it joins other Highland countians in packing hundreds of shoebox gifts for Operation Christmas Child, and a delegation from the church travels to Boone, N.C. to assist in the sorting and packing operations for the ministry. The church also supports the Southern Ohio Pregnancy Center Baby Bottle fundraiser, Gideons, and the Ross County Correctional Center Kairos Prison Ministry. The church meets each Sunday at 9 a.m.
Editor’s Note – Information for this article was compiled by Dorothy Countryman from the research of the late Gerald Newman and Joyce Frazer, as well as earlier work done for the congregation’s 175th anniversary by Mr. and Mrs. John E. Haigh.